Our Service Desk is the central point of contact and management for all ICT related and other in-scope tickets for our clients. It operates on a 24x7x365 basis and provides comprehensive services to clients throughout Australia and internationally. 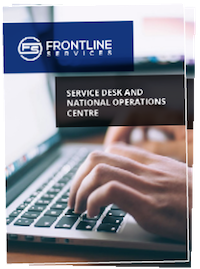 All new Service Desk team members undergo a thorough induction to ensure they understand Frontline’s service values, processes and client outcomes. As part of introducing a new team member or a new client, we run a detailed, client-specific induction to ensure our team understands your business, operations, locations and service expectations. Where practical, we recommend that this induction includes a site visit to reinforce the induction and give invaluable first-hand experience. core team is assigned to each client. By default, all incoming contacts are directed to team members who are familiar your business, ICT environment and expectations. Our goal is for your staff to feel like they are working with an extension of your organisation. We understand that users like to have their tickets resolved as quickly as possible. Our overarching focus is on maximising closure on first contact, a capability which is underpinned by our client-centric knowledge base. first contact we maintain ownership until closure. Regardless of whether it is escalated to internal resolver groups or a third-party, we track it against SLAs and follow-up as required, keeping the end-user informed as to the task’s progress. We invest significant time into the ongoing development of our knowledge base which is heavily leveraged across our entire service portfolio. Our knowledge base includes both client-specific knowledge as well as technology-centric tips and solutions. Maximising the use of the knowledge base drives efficiency, reduces close time, and leads to improved end-user satisfaction.